I have a secret. I am sleeping with something new in my bed and my nights have never been better! I have always had problems sleeping, either from tossing and turning from being restless, or whether I am just achy in pain not having enough “cushioning” were I need it. The Comfort-U pillow solved most of these problems. It is almost too good to be true. I tried so many types of body pillows in the past. I would even try to literally surrounded myself with “normal” sized pillows at night and nothing really helped that much. Designed by a registered nurse, the “Comfort-U Body pillow” was originally invented to help relieve fibromyalgia, a chronic condition marked by muscular pain and tenderness at specific points of the body. It has now been recognized as an effective aid to help anyone get a good night’s sleep. 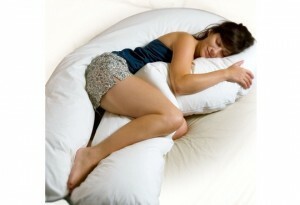 The pillow is a huge U shape which can wrap around your body or position however you need it. It doesn’t matter on what side you are laying – this pillow is everywhere. The ergonomic “U shape” cradles your body to help eliminate tossing and turning, keeping your neck, shoulders, back and hips aligned all night long. I saw a difference in the first night I slept when I awoke more rested and less achy. I also found that my general “rest” times were more effective as well, without wasting so much time “getting comfortable” by fidgeting. This pillow is not only good for people living with pain. I could only imagine that the pillow would be a perfect gift for someone who is pregnant, since this pillow would cradle the mother’s body and give support wherever she needed it. The fossfill filling allows the pillow to breathe and stay fluffy. Fossfil is a new hypoallergenic and antimicrobial material that inhibits dust mites. The white washable pillow case was included and it comes with a one year manufacturer warranty from date of purchase. They sell replacement pillowcases in different colors and fabrics and they even have a moist heat therapy pillow insert to go in the “neck” part of the pillow. Take note that the pillow is “human size” and is quite long, so you just need to think of where you will store it when not in use. Don’t get me wrong, you don’t want it to be shorter- you will love that it encompasses you and that is half the appeal. Nothing comes even close to this pillow. I am trying to save money, and I can certainly understand the inclination to try other products that might be less expensive, but this is the most deluxe body pillow I have ever used and I believe it is well worth every penny. I can’t wait to get one. I currently sleep with a minimum of four pillows but they often escape from me during the night so that I end up on my stomach occasionally. This thing is enormous but sooo worth it! I made my own pillowcase from a king size sheet. Highly recommend! I love this pillow, I have two. One for each of my beds. I cannot sleep without them anymore. they are amazing. Gosh, there are so many of these pillows listed. Is there a difference? And thank you for the recommendation, I have a few chronic illnesses and I can’t get comfortable on a bed unless I’m, literally, ready to pass out. bad in the morning. Defiantly recommended to everyone and anyone. WOW, This would be great for my R.S.D./C.R.P.S..I am in such pain, 24/7 Maybe this pillow would help me out..But, have to wait till next check to come in..Disability does not go far..Barely make it..But, this pillow is a must.. Yes agreed absolutely fantastic. Mine unfortunately has become thin at top and needs more stuffing. Find it is great for some restorative yoga. slide under knees for support in butterfly………around back across tummy to allow forward stretch fully supported to elongate the spine and neck. I just read your review of the Comfort-U pillow. Do you still enjoy the pillow? Do you have any problems with it? I am very interested in purchasing one because I have lots of pain in my left sacroiliac, sometimes my back, and sometimes my left knee. I have Ehlers-Danlos Hypermobility type. I went to the Amazon website, and while most people love the pillow, some complain of the scratchy zipper and the pillow deflating. I am interested to know your current opinion of the pillow to help guide me about purchasing it. BTW, I’m fairly short at 5’3″ and wonder if it’s too long for me. I put this link on Facebook, had a friend with fibromyalgia buy it. She loves it. Ordered a second one to keep in front room in her oversize chair to relax. Certainly looking forward to buying one for myself. Have fibro, UCTD, OA and can use the relief. Thanks for the review! Hi, i am going to buy one of these pillows for myself and one for each of my daughters, as we all have restless nights due to one thing or another.